Marc Matsumoto of NoRecipes shares his quiche recipe that can be varied to fit whatever vegetables or other ingredients you wish to include. Put the oven rack in the middle position, and then preheat the oven to 375 degrees F.
Line a 9" spring form pan with the puff pastry and go about 2" up the sides (you may need to roll it out a little if the sheets are too narrow). Cover with aluminum foil then add pie weights (dried beans or rice work well) to keep the dough from rising too much. Bake for 25 minutes. Put a frying pan over medium heat and add the bacon. Sauté until the bacon is cooked through and some of the fat has rendered out (about 5 minutes). Transfer the bacon to a paper towel lined plate and set aside. Add the leek to the pan with the rendered bacon fat and sauté until browned and very fragrant (about 10-15 minutes). Add the bell peppers and green beans and continue stir-frying until the green beans are bright green and cooked. Lightly salt and pepper the veggies and set aside. Whisk the eggs, cream and salt together until the whites and yolks are completely incorporated. When the crust is done, carefully remove the pie weights and aluminum foil. Add the hot sautéed vegetables, top with the cheese, the pour the egg mixture over everything, making sure no bits of cheese or vegetable are floating. Put it back in the oven and bake for another 35 minutes, or until the middle of the quiche is set and does not jiggle. 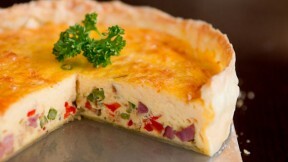 When the quiche is done, remove it from the oven and allow it to cool completely before slicing and serving with a side salad.